Evolis Dualys 3 dual-sided card printer with USB, 3 year unlimited print warranty including print head, FREE eMeida Card Design Software and lifetime phone support. The Evolis Dualys 3 With its speed, high-quality printing, numerous encoding capabilities and user-friendliness, the Dualys is the best dual-sided card customization solution on the market. Just as effective for monochrome thermal transfers as it is for color dye sublimation, the Dualys produces high-resolution prints that are comparable to photographic quality. Absolutely versatile, the Dualys includes the latest magnetic stripe, smart card or contactless encoding options. All of these encoding techniques are combinable, which allows you to customize your production of sophisticated cards in a single pass. 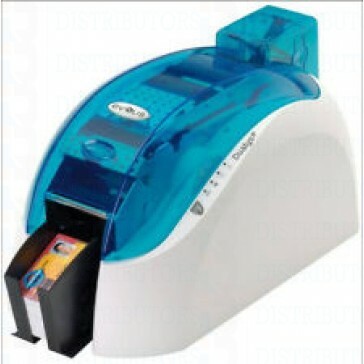 In addition to its 100-card feeder box, its optional manual card feeder instantly turns the Dualys into a front-desk printer. All of these possibilities pave the way for innovative applications in many sectors: identification, biometric security, leisure, loyalty, transportation, education and banking.Effective, versatile and user-friendly, the Dualys dual-sided color printer is the ideal solution for all your needs, from timely printing to high-volume customization.